I’m pretty sure if you’ve been reading this blog for a while, you most likely know I like Roger Corman films. Well this is no different: A Corman film that I like. 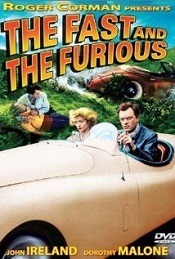 1955’s The Fast and The Furious tells the story of a man, Frank Webster (played by John Ireland) who was wrongly accused of murder and wanting to clear his name. Being pursued by police, Webster is forced to take a woman, Connie Adair (played by Dorothy Malone) hostage and steal her car, with Webster hoping to make it to the Mexican border, and freedom beyond it. In order to avoid police road blocks, they pose as entrants in an antique auto race. The fact that Connie knows some of the entrants makes things a little sticky. Along this crazy adventure, Connie falls for Frank and vice/versa. A tale of injustice and love, this movie has schlock written all over it – luckily it’s short and doesn’t give enough time to get sick of it. Actually, clocking in at one hour and sixteen minutes, this movie is just about the perfect length for it’s subject matter. Oh, and don’t go thinking that that crappy Fast and Furious film is a remake of this film – watch The Chase with Charlie Sheen to see the true remake of this film. This entry was posted on February 14, 2013 by catfishman. It was filed under Uncategorized and was tagged with 1955, B Movies, cheezy, dumb, Fast, film, Furious, ireland, low budget, movie, racing, Roger Corman, silly, Vin Diesel, wrongly accused.